Elise Simard discovered film animation while completing a bachelor’s degree in Fine Arts at Concordia University in Montreal. She was Artist in Residence at Aberystwyth Arts Centre in autumn 2012. 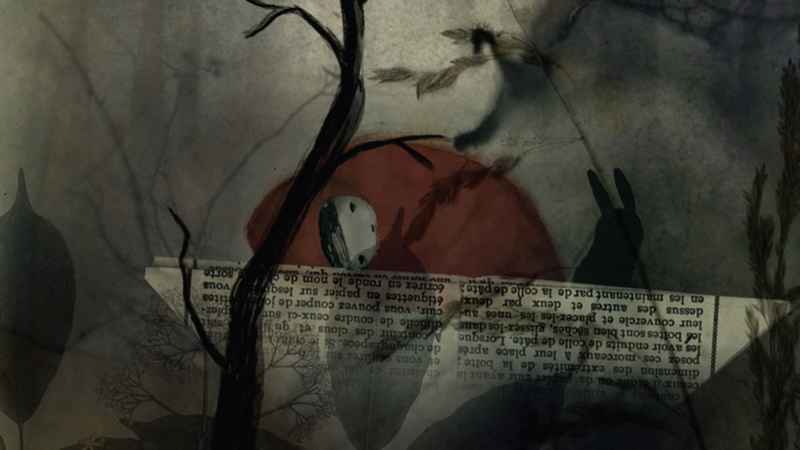 In ‘La Traversée’, Elise’s second independent film animation, a boy and his rabbit wander through the night forest – a mysterious and overwhelming world which vanishes at dawn. Directed and animated by Elise Simard. Copyright Dark Holiday Inc. Soundtrack music: Debussy’s Petite suite #1, En Bateau. Inspired by the secrets and sorrow of Robert Louis Stevenson’s verses for children, ‘Afloat at Dawn’ is a baroque ode to fleeting darkness and childhood make-believe, accompanied by a haunting soundtrack. Directed and animated by Elise Simard with the support of the Conseil des arts et des lettres, the New Brunswick Film Co-op, the National Film Board of Canada’s Filmmaker Assistance Program and TAIS, the Toronto Animated Image Society. Music arranged and recorded by Marc-André Simard.